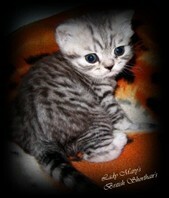 Buffalo sired 5 lovely kittens mated to Lady Mary's Silver Qiara. silver spotted kittens from this litter are 6'th generation silverspotted from Lady Mary's breeding. Buffalo sired his first kittens Jul-10, mated to Kathy de Lalique. 1 tortie silver tabby girl. Buffalo is a charming man. He has a beautiful head type, small well placed ears, and lovely round head. Important qualities that I find important to bring further. Time should show that he gave even more qualities to his first kittens he sired July-10, mated to Kathy de Lalique. 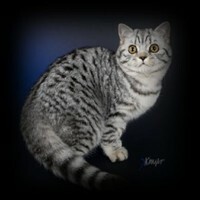 1 silver tabby boy, 2 silver spotted boys, 1 silver spotted girl and like their grand mother Tinka also in Lady Mary's T2 litter a black smoke girl should be born and very much alike Tinka too. 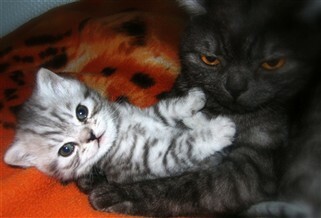 Buffalo's mother Lady Mary's Smoke Tinka was a wonderful mother.This is one of my favourite mother and kitten photo.